Recently, I've changed up my makeup slightly to make it more autumnal! 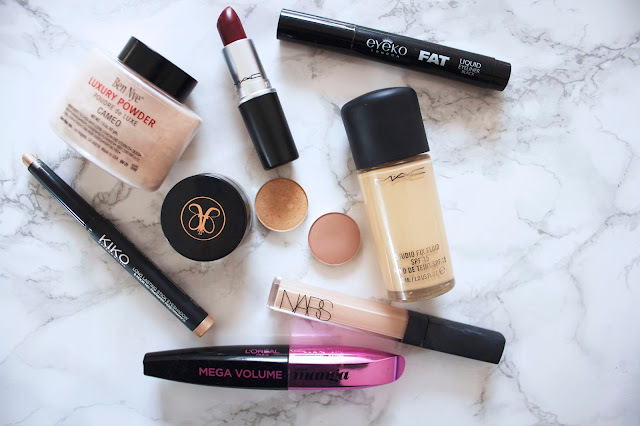 I've been switching between the Mac Studio Fix Fluid and the Too Faced Born This Way foundation as those are both my favourites at the moment. I then use my Nars Radiant Creamy Concealer to cover blemishes and under eye circles and finish off with the Ben Nye Luxury Powder in the shade Cameo. For my brows, I use my favourite product, the Anastasia Beverly Hills Dip Brow Pomade to fill them in and give them more shape. On my eyes I start with the Kiko Long Lasting Stick Eyeshadow in the shade 07, this is a really pretty champagne colour that works as a nice base, I then apply Kid and Ricepaper eyeshadows from Mac. I lightly apply Kid in the crease and blend out before popping Ricepaper over the lid. I've been loving the Eyeko Fat Liquid Liner for creating thicker lines and wings at the moment as it is really pigmented and lasts all day! To finish off my eyes, I apply the L'oreal Miss Manga Mega Volume Mascara which I love for adding both length and much needed volume to my lashes! Finally, on my lips is a new Mac lipstick I bought recently. The shade is Diva and I absolutely love it, I think it's perfect for autumn and creating for vampy makeup looks! What are your favourite products for autumn?